Arsenal will be desperate to make amends for the embarrassing defeat to Liverpool when they take on struggling AFC Bournemouth on Saturday afternoon, with the Cherries yet to put the first points on the board. 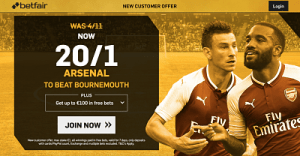 The Gunners have not been impressive this season, but this is the game they should win, so bear in mind that Betfair has enhanced the price on home win from 4/11 to staggering 20/1 for first time depositors. You do need to register through this link, entering promo code ZFBDED. Then place a max £1 bet on Arsenal at the enhanced price and you will be good to go. All winnings are paid as free bets.